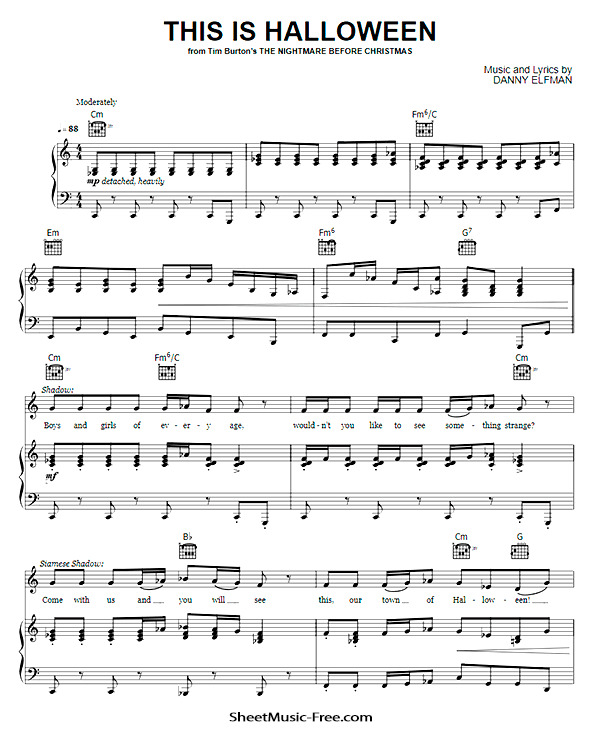 “This Is Halloween Sheet Music” by Danny Elfman, from The Nightmare Before Christmas Sheet Music “ This Is Halloween Sheet Music” for Piano Solo and Chords , Original key: C Minor, number of pages sheet music PDF: 8, Video and Piano Cover song This Is Halloween Sheet Music. “This Is Halloween’” is a song from the 1993 film, The Nightmare Before Christmas, with music and lyrics written by Danny Elfman. This Is Halloween Sheet Music Danny Elfman. In the film it is performed by the residents of the fictional “Halloween Town”, which is the film’s main setting, and introduces the town’s Halloween-centered lifestyle. The song is featured in both HalloWishes at the Magic Kingdom and at Disneyland’s Halloween Screams. In Calaway Park, it is featured in the haunted mansion. It is also used as the background music for the Halloween Town world in the video game Kingdom Hearts. “This Is Halloween” was covered by Marilyn Manson in 2006 for the special edition release of the film’s soundtrack and subsequently included on the 2008 cover album, Nightmare Revisited. The song was also covered by Panic! at the Disco for the 2006 soundtrack reissue. On the 2011 album V-Rock Disney, which features visual kei artists covering Disney songs, Sadie covered this song.